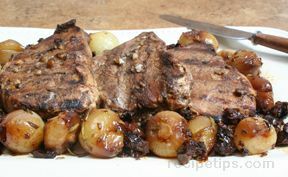 Place the pork steaks into a sealable bag and pour marinade over them. If you need more liquid, fill in with apple juice or water. Seal tightly and place the bag in a pan to catch any leakage. Place in the refrigerator and allow to marinate for at least 30 minutes. They can be marinated overnight if desired. Remove from the bag and rinse under cold water. Pat the steaks dry with a paper towel. Sprinkle the steaks with the seasoning and then place on the grill, which should be preheated to medium-high. Dab the steaks with barbecue sauce and cook approximately 10 minutes per side. If desired, baste a couple of times throughout the grilling time. When the steaks are done remove them from the grill and allow to stand for 5 to 10 minutes before serving. "My husband liked these with the barbecue sauce but I prefer my without it. 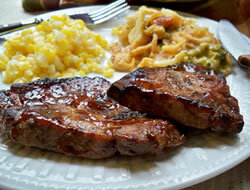 I tried this recipe for a little something different from just grilling our pork steaks. 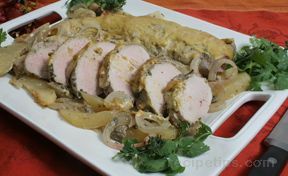 I will make them again some time for a change from plain pork steaks."